An intriguing take on JFK? Yes. “A Life Like No Other”? Hype. No unknown scandals or significant surprises spring from these pages. 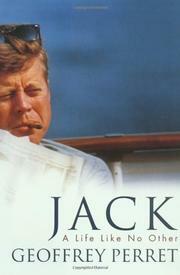 The major qualities that made Jack Kennedy so compelling a figure are here: intelligence, good looks, and charm. New documents—mostly diaries, letters, and oral histories from the JFK Library—allow, however, for the mapping of what the author calls “a hinterland . . . deep, strange and surprising”: John F. Kennedy as a romantic who lived life full-tilt because he correctly feared an early death. Biographer-historian Perret (Eisenhower, 1999, etc.) underscores the similarities between his subject and Lord Byron: Both lacked maternal love and suffered through ill-health in childhood, then as adults lived recklessly, bedded countless women, and inspired a whole generation through idealism and their own untimely deaths. In some ways, Perret depicts a more paradoxical, and sometimes vulnerable, man than the one we thought we knew: The self-mocking wit who reduced a roomful of listeners at a Thanksgiving celebration by mournfully singing “September Song”; a nominal Catholic who sought consolation in faith as his infant son Patrick lay dying; an avatar of youth and vigor who fretted over the jowly chin created by his medication. Kennedy’s charisma is shrewdly assessed (it combined “the two essential traits of the movie star—emotional power and psychological authority”), as is the impact of Addison’s disease and chronic back problems on his outlook and career. Unfortunately, though, Perret’s summaries of his subject’s character are filled with platitudes (“At eighteen, youth takes as its right a sense of being eternal, even when surrounded by the solicitous in white coats”), or by redundancies (notably, the stress on JFK’s penchant for speeding). Worse, Perret does not adequately explain why he dismisses some claims about the Kennedys (such as Joe Sr.’s illegal business practices) while accepting others (abortions procured by JFK for three different lovers). For a cradle-to-grave biography free of piety and pathography, start here. For fresh disclosures on this most intensely examined president, turn elsewhere.